Bundesliga | How will Bayern Munich line-up under Willy Sagnol now Carlo Ancelotti has gone? Former France international right-back Willy Sagnol has been appointed as Carlo Ancelotti's Bayern Munich successor on an interim basis. How will Bayern Munich line-up under Willy Sagnol now Carlo Ancelotti has gone? Bayern may only be three points from Borussia Dortmund's table-topping pace in the Bundesliga, but recent results have been uncharted territory for the German record champions. Five losses from six pre-season friendlies across the International Champions Cup and Audi Cup didn't augur well for the Bavarians, but it was the 2-0 defeat to Hoffenheim, the 2-2 draw with Wolfsburg and then Wednesday's 3-0 loss at Paris Saint-Germain that really put paid to the Ancelotti era. Sagnol, the assistant manager throughout this time, might readily revert to the 4-2-3-1 that brought Bayern an unprecedented fifth consecutive Bundesliga title last season. At right-back his hand is - happily - forced by the emergence of Joshua Kimmich as a genuine successor to Philipp Lahm for club and country, but with Ribery, Robben, Thiago Alcantara and Boateng reinstated on a full-time basis, the Frenchman could field a team with over 2,000 Bundesliga appearances to their name, four of whom started Germany's triumphant FIFA World Cup final against Argentina three years ago. But what if Sagnol decides to shake things up? 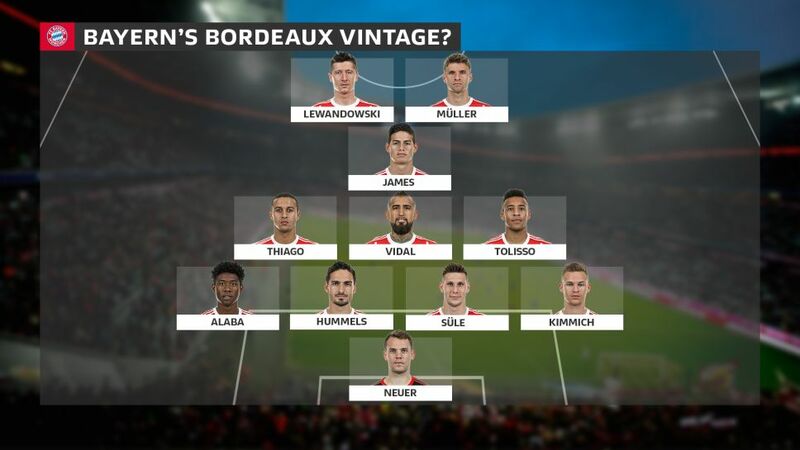 It's perhaps not why Bayern CEO Karl-Heinz Rummenigge moved to appoint the Frenchman, but a look at Sagnol's recent Bordeaux teams can shed some light on his preferred formation, and also, perhaps, whom he might elect to play. Sagnol, a five-time Bundesliga champion with Bayern between 2001 and 2008, was most recently a head coach with Bordeaux in France's Ligue 1 for two years from 2014, and he steered his charges to UEFA Europa League qualification in his maiden campaign. Could that season provide the blueprint for Sagnol's Plan B? Sagnol played an unorthodox 4-3-1-2 with Bordeaux, with a midfield base of Gregory Sertic, Jaroslav Plasil and Nicolas Maurice-Belay giving the mercurial Wahbi Khazri the chance to shine at No10. Nine goals and five assists from the Tunisian were a fine return for a team that finished sixth in the French top fight. Up front, target man Cheick Diabate was partnered with withdrawn forward Diego Rolan, who top-scored with 15. Further back, a defence with the overlapping Mariano and Diego Contento – a Bayern youth academy product – was underpinned by hulking centre-backs Nicolas Pallois and Lamine Sane, the latter of whom now plies his trade for Werder Bremen. Another who hasn’t quite clicked into top gear this season yet is James Rodriguez. The Colombian - signed on loan from Real Madrid - has shown glimpses of the class that saw him plunder six goals in five games at the 2014 World Cup, but he's so far had to share attacking midfield duties with Müller, as well as Robben, Ribery and Kingsley Coman. Sagnol’s Bordeaux formation frees him up, though. Müller aside, James is the only one of the aforementioned equally adept through the middle as out wide. James could prove to be the biggest winner from the latest developments in Bavaria, and there would be space in the side for him and Müller week upon week. Pallois and Sane both stood at 6ft 3in in that Bordeaux defence – height a prerequisite when the oppositions’ only recourse to a packed midfield and overlapping full-backs was to attack from wide and cross into the box. Süle may be the newest recruit, but pushing 6ft 4in, it could well be a question of who partners the former Hoffenheim man. Whether he sticks or twists, the Sagnol story at Bayern figures to be a page-turner, regardless of how fleeting it may prove to be.